Wow. It’s been a while since I’ve been here. It’s not for a lack of loving my tripawd community but still, my knee jerk reaction is to feel guilty. But then I stopped to ask myself why it’s been so long. I’m HEALING. I didn’t think I ever would. I wasn’t ever sure I wanted to. So what’s been going on? Well, I’ve had stretches of time where I don’t cry every day. I can tell funny stories about my girl and can smile and talk about her. I’ve even watched some of her videos. A good friend and I were talking recently and we decided that even though the sadness will never go completely away but it won’t be as intense or as often. You bet your tripawd I still miss my girl and especially now that the holidays are upon us. We are all talking about what we’re thankful for. I’m thankful for a lot but I’m sad about a few things too. Halloween was tough. We usually took the dogs trick or treating and they loved being out with the kids with their little glow sticks around their paws. Patches loved kids. Thanksgiving was tough. There was one little care package for Rooster (okay a big one) but not one for her. Christmas will be tough…….little girl’s stocking will be on the mantle with treats for Rooster in her honor. I don’t know if he will eat them. The firsts are still hard. But that hole in my heart is healing. It won’t go away but the jagged edges are smoothing over and it’s no longer a code blue. I have my moments where all of what I wrote just now goes out the door and it’s like it happened yesterday. But then happen less frequently and I have moments of sincere happiness again. I’m sort of happy to be healing and maybe a little sad at the same time. Part of me thinks I’m forgetting about her. The other part of me says “as if”. As if I could ever forget my little angel and her antics. Her big, beseeching eyes. Her doggy sneezes in my face. As if I wouldn’t ever want her back. Oh the things I would give up to have her back. But the finality and acceptance is setting in and if I’m not relieved at least some of the people around me are. It was hard on my son to see my cry all the time. When I cry he cries. And I’m not the only one who was grieving. He told me his dad was on Canaan rescue sites looking for Canaan’s in need of adoption. He showed me a picture of a white girl named Phoebe. She could have been Patches. My ex-husband is looking for another dog just like Patches. And I thought he didn’t care. How wrong I was. We all show our hands in different ways. I just don’t have poker face at all. I’ve learned SO much from our experience with canine cancer, about myself, my heart, my dogs and my life. I know that someday when the time is right I will adopt another tripawd. I have too much love in my heart not to have another dog or cat (or bunny or parrot or gerbil or turtle……) in need. Only this time I’m prepared. I know what could happen; I know what I’m signing up for. The first time for everything is difficult…….my first experience with a sick pet brought me to my knees and just about broke me. But I go forward, my heart waiting to see her again so it can be whole once more. I gave her a piece of it to take with her. I wait to get through the first holiday season without my girl. I have focused on getting my health and head back in order. I am fit and 25 pounds lighter physically. Spiritually I still have some more weight to lose but I’m healing and that’s what counts. Overall I would say that I’m healing and feeling like myself again and being there for my son more and even myself and loved ones. I’m proof that there might be a light at the end of the tunnel that isn’t a truck or a train. It might actually be a gift, this healing thing. Tis the season afterall. With love and light to share with all of my cherished tripawd family……….. I thank you for reading. With a Sylph in my Heart…. August 27th was my girl’s one year ampuversary…..I tried not to think about it. Which was about as effective as trying not to breathe. It was another first that I gritted my teeth through. But….. I was talking to my girlfriend on the phone that day, sitting in the little alcove outside of my kitchen, talking about how, just a year prior, my girl was in surgery. As I was talking to my friend, yes, another dandelion sylph floated in front of my face. And this time it gently floated to my feet. I stopped mid-sentence. My friend wondered what in the world could render me speechless. I picked up that sylph with a tear in my eye and a smile on my face and put it right in my heart….my heart locket that is. The very heart locket that has one of her hairs in it. Being the firm believer that I am (for everyone else but me), as soon as I hung up the phone I went on the hunt for a dandelion, even one from which that sylph could have come from. There’s not a dandelion for miles in my yard, neighborhood, zip code, there are none to be found. Where could that seed have come from? My inner skeptic was on high alert. Given that it’s the second time this has happened as I was thinking or talking about my girl I finally let myself believe that it really is my girl talking to me. And it made me smile. I do smile more now. I still cry too but I can talk about my baby with a smile on my face. We can even laugh and tell stories. We still miss our girl every day but missing her doesn’t occupy my thoughts 100% of the time anymore. I don’t have to force myself to distract myself. I can genuinely enjoy moments, people and things again. I’m in a good place but I know there are more hard days to come. I feel stronger and more prepared this time because there is no more ambiguity and stress and worry. Just a lot of memories to cry my way through. And it’s all ok. I decided a while ago that I would be ok with never getting over losing her and I’d be ok with crying for her every day. Well, I’m not over losing her but I’m not crying every day. I’d say I’m getting by and feeling better. There is more processing to do and more missing to do, but I know I can and will do it. And so I carry on with a hair and a sylph and love in my heart where my girl still lives and always will. It seems like it was only yesterday that I lost my baby. I was doing good for a while. At least I thought I was. What I was good at was distracting myself and just going on, sometimes just going through the motions and sometimes being happy. But this month is already hard. I can’t sit outside and work without seeing an image of my girl lounging on the lawn with a smile on her face, a sunbeam warming her little tush. There are permanent lines in my face from tears I think. Last year at this time her limp was getting progressively worse. I’m reliving my guilt at not having been smarter and taking her to the vets sooner. I am guilty about so many things and there’s no escaping myself. The distractions aren’t as good as they used to be and I feel like I’m sliding backwards. Grief and loss are not for the faint of heart. Sometimes I don’t know what to do with myself. I’m driving with tears running down my face, hiding in bedrooms and bathrooms so others won’t see my crying my eyes out. I had another moment of panic. I have a locket with my girls name on it. I wanted to find another of her hairs to put in so I’d have more of her with me. I panicked when I went through the house and couldn’t find even one hair. I broke down. She’s gone, really and truly gone, did she ever exist? And when I broke down I sat down on the stairs. And there in the very crook of the carpet on the stairs I saw a bunch of her hair. I grabbed a stash and I’m hoarding it. I miss her, achingly so. The memories of last year are creeping in and I’m getting scared again. Of what? I really don’t know and I’m having a hard time getting out of my own head. And when I get like this I come to my tripawd community. Somehow………..and I can’t figure out why and it’s not important but somehow knowing other people know this pain, have lived or are living this pain and giving me words of encouragement…….somehow it helps. You don’t think I’m crazy. You don’t think I’m dwelling or hanging on or “stuck”. I’ve told people I’ll never get over this, never be the same. The only people who understand are people who have been there, done that, know it and don’t judge it. The pain is acute again. I feel like I’m running away from it but it’s “dogging” me. I know it’s going to be a long trial here from the anniversary of her diagnosis to the anniversary of her passing. I thought last year was hard but at least she was still here. This year …….it’s already brought me to my knees like a blow to the stomach. I gained 20 pounds last year from the stress of worry, work travel moving and life. I’ve lost that twenty plus a couple for good measure. This year is different. I’m no longer eating to fight the sadness that was eating at me. I’m tending to not want to eat because I feel empty and I can’t handle food…….I’m tending to want to sit and give up a little. I feel like I’m still in shock and thank goodness I have my son and Rooster and my friends. Very un-me. I’m going with it. What else can you do? I just need to do enough to get by for now. I can put on a good face and fool the world but I can’t fool me. Me and Rooster, we sit and we hug. I cry, he licks away the tears and he knows why I’m crying. I know there aren’t any answers. I guess I am going to just hunker down in the trenches and wait for brighter days. Hard times my friends, hard times. Three months can be the length of a summer vacation. My son just started his and he is ecstatic. It can be the end of a first trimester, when you’re past the “trouble zone”. It can be your 90 day probation at a new job. All exciting stuff. It can also mean my girl is gone three months exactly today. I knew it in the back of my mind. I was trying to ignore it and not think about it. I’ve been doing that a lot lately. It’s become a sort of coping mechanism. I started doing that because not too many people care to listen to you talk about something that happened “three months ago”. They get “the look” that says “again? When are you going to be over it?”. I know they don’t understand. They can’t. I’m surprised more people can’t really empathize that well. I’m surprised at a lot of things. Surprised that people would think that I could get over losing the girl I had in my arms for 9 years who I will love and miss forever. I’m not bitter or mad. I just think I gave people more credit than I should have. And maybe I’ve been that person in the past and this is my lesson in understanding. Trust me. I understand now. It’s been three months of learning, longing, laughing, crying, aching, reminiscing, guilting…..everyone here knows it. I really am better in that I don’t think about it all day every day and cry in front of people. But the tears are right behind my eyes ready to come out at the mere thought of my girl. I’ve been suffering from a lot of guilt about things I would tell another person not to be guilty about. I’m coming up on some really hard “firsts”. First summer without my summer baby. Last year around this time we noticed Patches tripping a little. We thought it was her eyesight and put on more lights for her and cleared paths better. Looking back I feel so stupid. Then she began limping and we thought that, like her brother, she might have pulled a ligament. He healed on his own. We thought she would too. She got progressively worse as the summer went on. I am trying hard not to think about it and it’s taking energy to NOT think about it while I’m still actually thinking about it anyway. I don’t think I’m at a plateau. I think sometimes are better than others. Some days we see progress. Sometimes we run back. I’ve admitted that I don’t think there will EVER be a time that I talk about or think about my girl when I don’t cry. I don’t think I’ll ever get over the trauma, the experience, the loss. And I am perfectly ok with that. I haven’t retreated from life. I work, I exercise, I eat healthy, I parent, I love on Rooster, I see friends, go out with family. I have lost 17 of the 20 pounds I put on when I was depressed and couldn’t leave my girls side all winter. I care about my health again. I can do all of that and still know that I’ll never get over missing my girl. Never get over losing her, how we lost her, how she was sick, all the bad stuff. I remember the good stuff too. I can look at pictures. I can’t watch videos. I still kiss her picture. I have her fur in my locket. It’s been a long, hard, productive and educational three months. Early on I thought I’d be further along than I am now. At this point I don’t really care where I land. Three months, three years, three decades…..if I am where I am now I’m still ok with it. To me three months means a quarter of a year in the rest of my life has passed without my girl. And there are more to come. Nothing changes the hard cold facts. I wonder if I’ll feel different in three months. More time is definitely required. But I’m still going, thinking, praying and thanking God for good friends who DO understand and listen, for my Rooster and my son and for the Tripawds community. It’s all I can do for now. And that’s ok.
And With a Single Dandelion Sylph…. Warm weather is in full swing. And so are dandelions. Oddly enough we have none in our front yard, which is where I work when I work from home. Rooster won’t let me work inside with the central air. Thanks buddy. 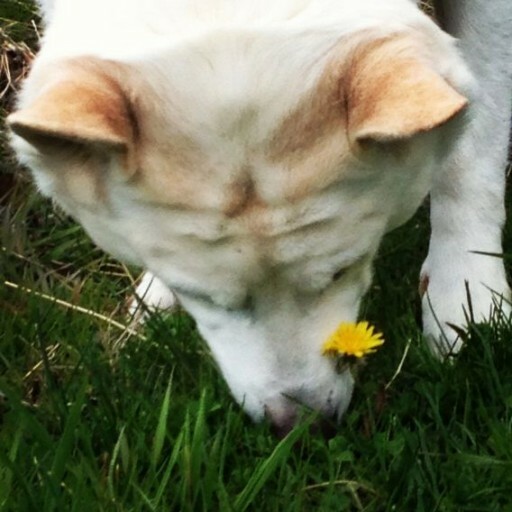 Anyway, I have an adorable picture of my Patches intently sniffing a patch of grass, her thinking wrinkle going strong and with a single yellow dandelion in front of her. It’s most adorable. I almost got a tattoo of a dandelion shedding it’s little sylphs in the wind as a tribute to my little lady (my son named them sylphs after he watched The Spiderwick Chronicles and the little sylphs had faces). To me dandelions are her flower, her sign. Today I’m sitting out in my little kitchen alcove outside my house thinking as I inevitably do about my Patches. I’ve gotten much better, I feel lighter, not as much pressing sadness. About a week ago, after more than a few concerned looks when I couldn’t hide my red eyes on more than a few (hundred) occasions I decided I needed to pull myself up a little more and try not to think about her so much and be so sad, if only for the people around me who love me and are concerned and would do anything to see me smile again. And it seems to be helping me. I also have talked to my 15 year old son of all people from whom a wealth of wisdom blooms. Last night in the car he said he thought I seemed to be doing better. I told him that I try not to think about her so much and try not to be sad as much but that sometimes that felt wrong because I never want to forget her, never want to not honor her for her love and courage. He wisely said “mom…….we will NEVER forget her and never stop loving her. But we are still here and she wants us to be happy, happy that she’s happy and happy that we got to have her for as long as we did”. And it’s so true. I told him he was right right but I that want to make sure I give myself time to do the healing I need to do. Time to let a year pass, a year of firsts for everything I used to do with her and now have to do without. You don’t do 9 years of loving and 7 hellish months of caring, loving, worrying and crying in 2 months. It was a wonderful chat. I feel like more than any of the adults in my life he gets me and the whole situation best. I’m a medium, I think I’ve said it before. I’ve had relatives come to me after they’ve died with messages. Recently I had a dog come to me with messages and another spirit came with a message for a man for whom a profound healing was begun thanks to her connecting with me. I love being a medium. I love helping others and to see them happy and hopeful, it brings me joy and lets me know I’m doing the job I’m here to do the right way. That being said, sometimes I feel like the bridesmaid and never the bride. I wish my girl would talk to me directly, somehow. She has gone to others in their dreams and they have given me the message. I’ve had other signs that I question because it’s what I do. I’ve been longing for a concrete and indisputable sign from her that she’s around and happy. Today I was sitting in my little alcove wistfully ruminating and I asked her why she wasn’t talking directly to me. And when I looked down at what I thought was a bug hovering between my eyes and my computer screen I saw what it was that had appeared as if from nowhere. A single dandelion sylph. It floated before my eyes for about two seconds and then it floated straight up and away. And with a single dandelion sylph my heart lifted. My girl finally talked directly to me. My love still burns bright for her, a beacon for her to find me whenever she wants or needs me. Hopefully she comes to me again. And again. But with the single sylph I feel better knowing she’s smiling on me. Maybe this is the beginning of a smile every day. I’m working on it.